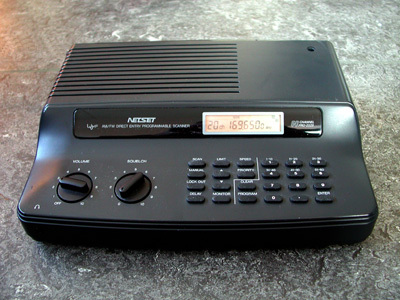 The discriminator IC is a KA3361 (DIL), a clone of the well known motorola MC3361. The unfiltered baseband signal can be found at pin 9. 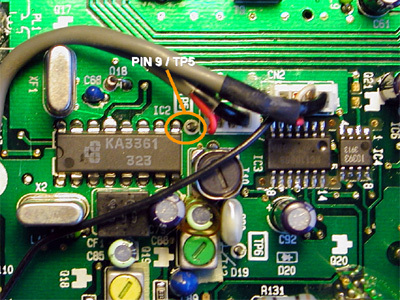 Close to pin 9 of the KA3361, test point 5 (TP5) can be found. This point appears to be connected to pin 9 of the IC. A 10 k resistor is soldered to TP5. The resistor can be mounted vertically. 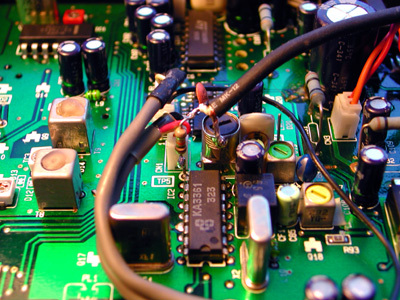 Because the discriminator output contains a slight IF component at 455 kHz, the other lead of the resistor is connected to a grounded 2.2 n capacitor. This creates a simple RC lowpass filter with a cutoff frequency of about 7 kHz. The IF signal is suppressed effectively. The ground lead of the capacitor can be connected to the shield of the IF coil nearby. A piece of shielded wire connects the discriminator output to a 3.5 mm chassis terminal in the back of the scanner. 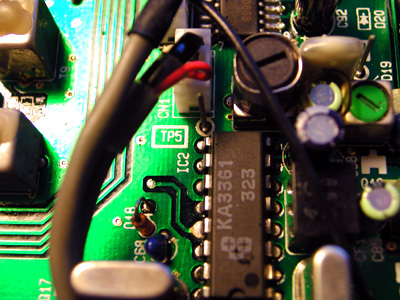 The core of the wire is connected to the junction of the resistor and capacitor. The braid is connected to the metal shield of the IF coil.